Definitely a thumb's up for this great dish with good price and I would recommend you to try this once. Below are their compliments dish whether you order the food or not. You can usually have this dish as the breakfast or snack around 2pm onward. 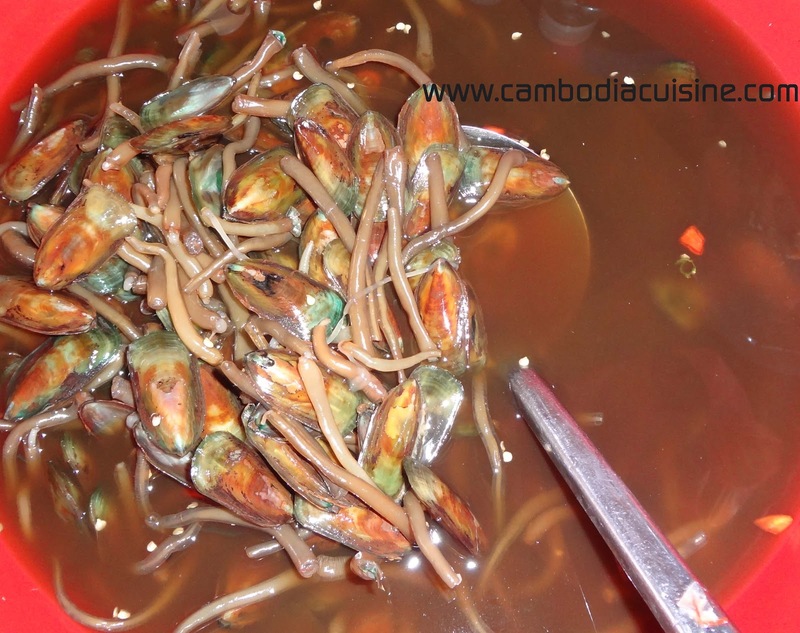 Fry short noodle is a common dish you can find almost everywhere in Cambodia. There are pushing cart that selling this, in the market or in a nice a restaurant. I had this Fry Noodle dish 2 days ago at Park Cafe. Going to Kampot Province mostly is for the food because the sea and the sand over there is not as beautiful as in Sihanoukville. But mostly Cambodian love going to Kampot Province and Kep to taste the fresh seafood, local dessert and many other dried products like shrimp, pepper, pickle garlic, Karchive (Appetizer for drinking beer). Coca Restaurant in Cambodia established many years already and they are famous for their breakfast. They have their special breakfast menu different from others such as Noodle Soup with Peking Duck, Soft shell Noodle, Abalone Noodle Soup, Australian Scallop Noodle soup and many others. This morning I've tried the Peking Duck Noodle Soup. There are not much noodle in the soup, the duck was seared to the part without bone and place on top of the noodle and spread some chives on top of that. The soup taste nice, the duck taste nice and overall I give a thumb up for the dish. My husband's favorite breakfast is Rice Beef Lok Lak with extra 2 eggs. He never had enough of it. Today Beef lok lak and tomorrow beef lok lak again. and I've tasted some of the rice - beef. It is quite addictive since the meat is juicy and it goes well with pepper lemon sauce. The rice is fried with the left over sauce from cooking of the Beef and when you chew sometime to stumble with the garlic and it taste really magical. So, you should try once and don't forget to ask for pickle pepper. 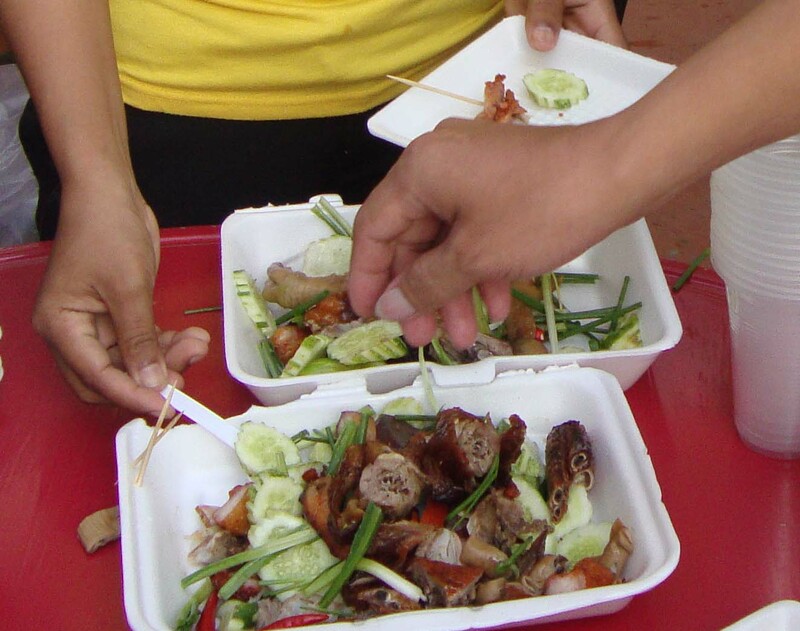 You should try beef Lok Lak at Park Cafe - Parkway Square - Phnom Penh - Cambodia. Park Cafe located in Parkway Square and opposite of Chinese Embassy on Mao Tse Tong Boulevard. Let's continue our Peking duck journey on Monivong Boulevard today. You can buy the Peking Duck as display in the images below from 4pm onward and it ran out quite fast because lots of people like the taste of these duck especially its sauce. So when you arrive at this place, you select your preferred duck and told the seller if you want to buy whole, half or which part, you can let them know and they will cut for you. Different part of duck is sold at different price. One whole duck is weighted around 2 kg. 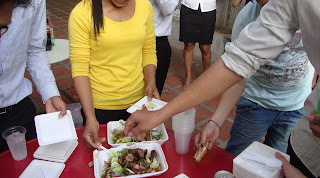 Like this picture, we have a surprise birthday and no one have prepared food except the cake. So a quick drive to the nearby Petchen Boulevard and here we go plenty of Peking Duck or Roast Duck. When you buy Peking Duck, usually they give you cucumber and its sauce or gravy. So, Deeping the Duck with those sauce is the correct way of having Peking Duck. Let's enjoy and stay tune for more duck related food in Cambodia and Street Food related with Duck.